Hearing aid batteries are an important maintenance item when taking care of your hearing aids. Finding the best hearing aid batteries for your device is easy especially here at Hearing Dynamics. We carry a full assortment of high quality batteries for hearing aids, and we are your premier provider of hearing aid batteries in Sierra Vista. We field a lot of questions about batteries for hearing aids. Your hearing aid needs a steady power source from a superior battery to work well. Proper use and care of your batteries is very important to maintaining a quality sound from your hearing aid. Please take a few minutes and view this educational video about batteries for hearing aids. In this video the audiologist talks about hearing aid batteries, how to change them and other common questions. The typical size 312 disposable battery will give you approximately 5-7 days of battery life. While this may seem like a short time, remember that this tiny battery needs to power a tiny computer that is constantly processing sound. Disposable hearing aid batteries are often called Zinc-Air batteries. The primary chemical substance in disposable hearing aid batteries is zinc and when you remove the sticker/tab from the back of the battery, air mixes with the zinc creating an electrical charge. This 1.45 volts is strong enough to power your hearing aids. What will affect battery life? What NOT to do with batteries for hearing aids? 4. Do not ingest them!!! What to look for in a battery? 1. Fresh batteries – hearing aid clinics typically have the freshest batteries. Be prepared to try several different battery brands to find the one that works best with your hearing aids and lifestyle. If you prefer not to use disposable batteries, you can convert your existing hearing aids to Silver-Zinc batteries with a Z-Power conversion kit. 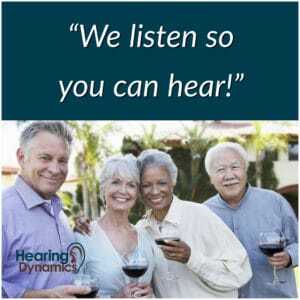 Just ask your hearing care provider at Hearing Dynamics. I’ve had the greatest success with Hearing Dynamics. The best, friendliest service I’ve had. I was one of the first people to try the new Siemens Binax hearing aids when they were first released on the market, and I’m very pleased with them! They help me with background noises and over the telephone.I have been with this company since it opened and I have received the best service from them. From the day I purchased my hearing aids right through going back in for routine cleaning which is a free service included in the purchase. From time to time I also have a free hearing test to ensure that my hearing hasn’t changed. They are trustworthy and honest, which is awesome in today’s environment. I highly recommend them.